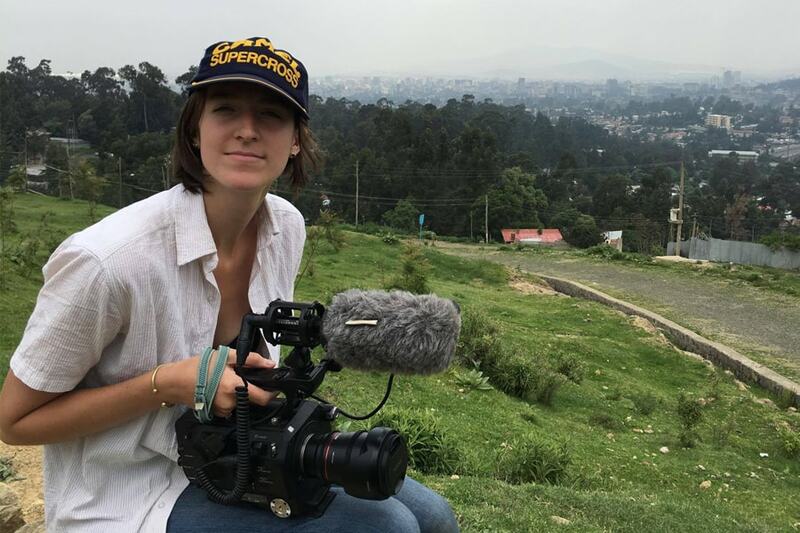 Kaytie Nielsen, an alumna of Carnegie Mellon University and international filmmaker, is adding to her impressive list of credits. The 2016 graduate is the fourth CMU student to earn the highly selective international Marshall Scholarship, which funds up to two years of graduate study in the United Kingdom. Nielsen, who earned her bachelor's degree in humanities and arts with concentrations in creative writing and drama, plans to study screenwriting at the National Film and Television School in Beaconsfield or the Royal Central School of Speech and Drama in London. The award covers a year of university fees, tuition, books, a thesis grant, research and daily travel, including airfares. "I hope this experience will teach me what I bring to the table as a storyteller that may be unique from other writers," Nielsen said. "I want to know what my strengths and weaknesses are, and become more confident in going after the stories that may seem too ambitious." Nielsen's portfolio is broad and includes creating films in France and India. As part of the Dietrich College of Humanities and Social Sciences Honors Fellowship Program, she worked with Mame-Fatou Niang, an associate professor in French and Francophone Studies at CMU, to create a documentary investigating Afro-French womanhood by exploring the lives of seven influential women of African and Caribbean heritage from diverse professions and socioeconomic backgrounds to shed light on a multicultural France. Nielsen took French courses from Niang throughout her CMU experience. "I was immediately taken by that freshman from Texas who approached our discussions in class with a maturity and an energy that was rarely seen," Niang said. "Kaytie was curious to learn, but also curious to understand how our world functioned." In "Mariannes Noires," seven different French-born women of African descent confront their own unique identities and challenge the expectations of French society. The documentary, "Mariannes Noires," was premiered in Paris in March 2017, has been screened in more than 10 countries and appeared in a number of film festivals, including the Toronto, Montreal and San Francisco black film festivals. Niang said that other universities have incorporated the film into their teaching and research materials and the footage has been an important part of Niang's CMU courses. "I can say without a doubt that this film would have been very different without Kaytie's intuition, her drive and her soul," Niang said. "Kaytie has a natural ability to listen and craft her message to reach a wide audience. In that sense, her work as a filmmaker and a social justice advocate is extremely impactful, because she can reach to the heart and soul of very different audiences, without altering the strength of her initial message." As a senior at CMU, Nielsen was awarded a national competitive fellowship from the Henry Luce Foundation, which provides stipends, language training and individualized professional placement in Asia for individuals from various fields and backgrounds who have limited exposure to Asian culture. She worked with Jamun, a New Delhi-based creative production company run by Ayesha Sood, director of "The Dewarists," and Udayan Baijal, assistant director of "Zero Dark Thirty." "Those two are truly amazing mentors and welcomed me to the team immediately and wholeheartedly," Nielsen said. "With them, one of my main projects was a series of campaign videos I shot and edited for Help Delhi Breathe, an organization fighting for policy action against the city's deadly pollution levels." Watch The Runner — Help Delhi Breathe from Jamun on Vimeo. "It was at Jamun, too, that I had my first experience in a Writers Room, as I helped them develop original fiction and non-scripted concepts for their slate," she said. As a freshman, Nielsen was one of six students nationwide chosen for the Fulbright Commission's Queen's University Belfast Summer Institute. She spent a month studying Northern Irish history. She put the research to use in her junior year when she created "Éire," a musical featuring the songs of Irish artists from old folk tunes to U2 that followed the lives of two women immersed in different periods of the 20th century Irish conflict — one in 1916 Dublin, the other in 1972 Belfast. "In a history that's so often told through a male perspective, I wanted to explore how women were both affected by, and active participants in, the violence of the time," Nielsen said. "A group of School of Drama students and I, working with a full band from the School of Music, produced the show as a part of Playground, our annual festival for student work." For these awards and others, she worked closely with Carnegie Mellon's Fellowships and Scholarships Office. Stephanie Wallach, assistant vice provost for undergraduate education and head of the Undergraduate Research Office, has known Nielsen since her freshman year. "It was clear even then that she was unusually talented, self-directed, fearless and, I might add, so much fun to be around. I have enjoyed every opportunity to work with her, whether it was her application for a Fulbright Summer Institute or the Luce Scholarship. At every point, I saw her maturing and discovering new sides to her multifaceted talents," Wallach said. "The Marshall Scholarship is the next stage of Kaytie's artistic and personal self-discovery. She will take every advantage of this unique opportunity in the UK not only to hone her writing and production skills but also to absorb and understand British culture. She is someone I feel privileged to know and to work with and I think that she will be an important creative force in the future," Wallach said. Nielsen said she owes much to Wallach. "Stephanie Wallach and I formed a close bond in undergrad, and I really do owe so much to her. She pushed me on this application in particular - but because I trust her so innately, I knew that the ways she was challenging me were always to make the best application possible," Nielsen said. Nielsen also is an entrepreneur. During her junior year she co-founded Round Room Image with CMU alumnus Joe Hill, now an associate producer at Vice News. Their creative production company challenges social narratives with honest representations that aim to provide a platform for unheard and misunderstood stories. "Our inaugural project was a series of documentaries shot in Tamil Nadu, India, for Visions Global Empowerment, a nonprofit focused on providing educational opportunities and leadership training to marginalized women and girls around the world," Nielsen said. Since then, Round Room has produced short and feature length documentaries, news pieces, music videos, educational series and social campaigns. Other projects include "Queiro," a talk show web series about Latinx ambition and success, co-produced with CMU alumnus Priscila García-Jacquier. As executive producer, director of photography and editor, Nielsen is involved in every facet of the production. The second season was shot this summer in Los Angeles and is in post-production. This past fall she worked as an intern at Pretty Matches Productions (Sarah Jessica Parker's production company), and is currently an assistant in the Writers Room for the third season of HBO's "Divorce."